With the winter crowds thinning out and temperatures still comfortable before summer turns up the heat, spring is a great time to enjoy Dubai. Here are some popular ways to make the most of the city’s sights, outdoor activities, and desert wilds between mid-February and early May. See the best of old and new Dubai from a hop-on hop-off bus tour, where you can opt for a seat on the open-air top or in the air-conditioned lower deck. Tour downtown and modern Dubai to admire its futuristic architecture, such as the Burj Al Arab hotel and the Burj Khalifa, the world’s highest tower. Dive into the aquatic fun of the Aquaventure Water Park at the Atlantis, The Palm hotel—ideal for cooling down when the sun is high. Gaze down instead of up at the skyscrapers on an exciting helicopter flightseeing ride over the city. Ride horseback across Dubai’s sands to feel the full beauty and vastness of the desert. Bounce across the Persian Gulf for widescreen views of the city on a coastal speedboat tour. Experience the desert at its most magical with a sunset 4x4 dune bash and barbecue dinner at a Bedouin-style camp in the sands. Cross the dunes by vintage Land Rover to spot gazelle and other animals before a night under the stars on a wildlife safari and overnight stay. See Dubai's main attractions on a City Sightseeing hop-on hop-off bus tour. With your 1-day, 3-day, or 7-day pass, you'll enjoy unlimited sightseeing along eight routes, taking you to more than 35 top Dubai attractions including Jumeirah Beach Park, Burj Al Arab, the Dubai Museum, Burj Khalifa, DIFC, Sheikh Zayed Road, Madinat Jumeirah, Gold Souk and Dubai Creek. Your hop-on hop-off pass includes a VIP Global Village entry ticket, an Arabian Dhow Cruise, and more fun perks! Take your taste buds on a journey around Dubai’s multicultural cuisine on this 3-hour private food tour. Learn about the city’s historical culinary influences while exploring souks and traditional eateries, and enjoy up to 10 food stops to try local specialities and goodies. Sample fresh prawns cooked in spices, dig into a camel burger, and savor saffron ice cream, lemon mint juice, stuffed vine leaves, traditional coffee, and more. Escape the city for an unforgettable evening in the Dubai Desert Conservation Reserve. Watch the sunset over the Arabian Desert, ride a camel, and sand-board through the sand dunes, then tuck into a 3-course dinner beneath the stars. Hotel pickup and drop-off is included. Settle into a saddle for a relaxed morning or afternoon desert horseback ride on this exciting experience from Dubai. Mount up at a professional equestrian center, and set off on horseback into the desert wilderness, led by a professional instructor. Enjoy the beautiful morning or evening light, soak up the peace and majesty of the desert, and as you ride across golden sands and red, rolling dunes, watch for desert wildlife. Hotel pickup and drop-off and light refreshments are included. Experience the wildlife and beauty of the desert by night on this 5-hour private experience from Dubai. 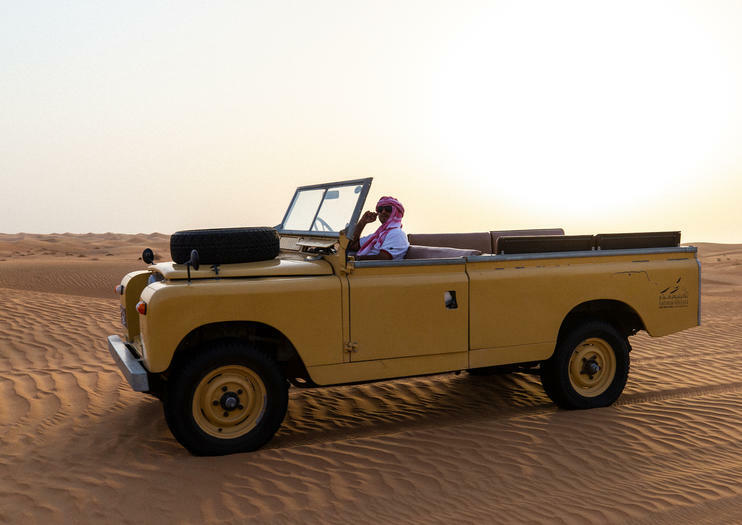 As dusk falls, board a private vintage Land Rover for a wildlife-spotting drive around the Dubai Desert Conservation Reserve. With a private driver, roam the dunes and use the night-vision binoculars and headlights to spot nocturnal animals foraging in the darkness. Then, relax at a royal desert retreat with a delicious 2-course dinner and stargazing session with an astronomer guide. In summer, upgrade to enjoy your wildlife drive in a plush Range Rover.